We went to sleep watching the snow fall and woke up next morning to a second snow day. School cancelled once again. Potty training put on hold and three children to entertain with no where to go. Our street had been turned into an ice rink. Not safe to walk on or drive a car on. 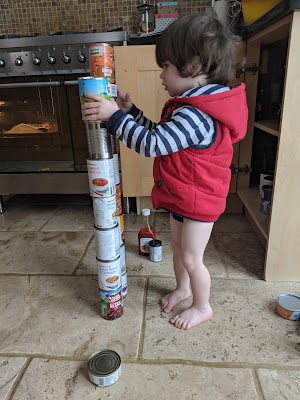 Little Man wasn't too fussed about venturing outside and instead opted to build towers with the food tins. We did venture out briefly after lunch but no one wanted to stay out for too long. The snow was icy and not as much fun to play in. 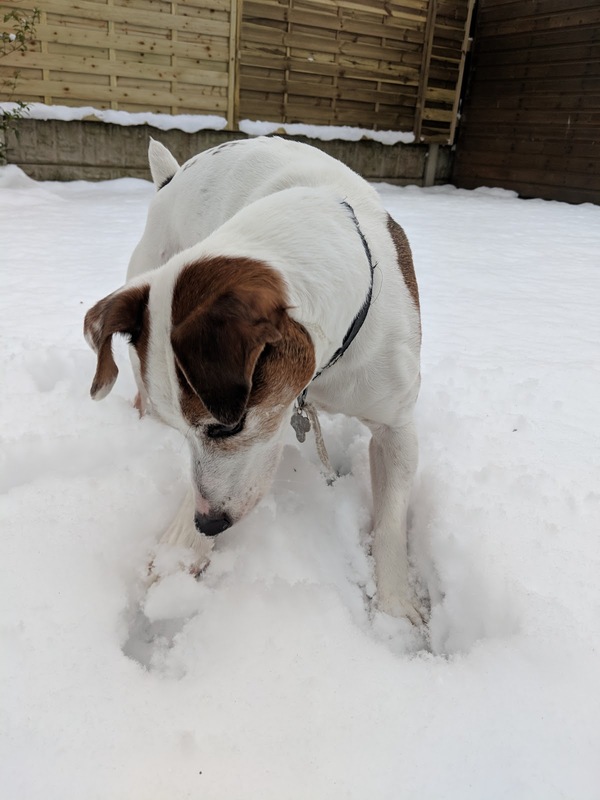 J didn't seem to mind and was still as confused about where a snowball disappears to. 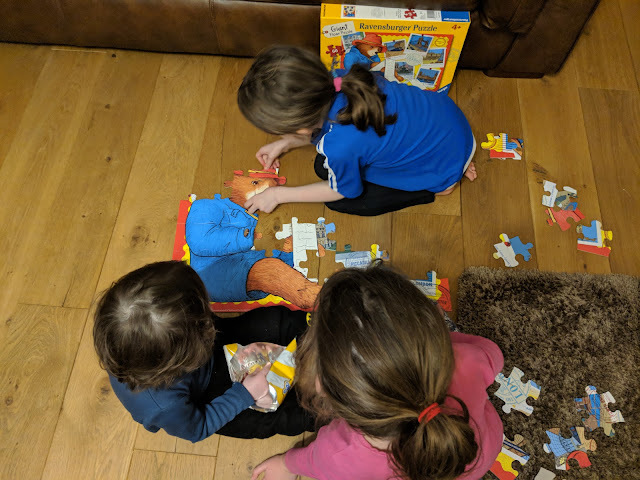 Whilst I got dinner ready the girls and Little Man decided to work together to complete the Ravensburger Paddington Bear Giant Floor Puzzle. The Giant Floor puzzle has 60 large pieces. Big enough for even Little Man to have a go at building. He had a few attempts but mostly watched his bigger sisters put the pieces together. The pieces were bright, bold and really colourful. It is perhaps no wonder he was so interested in watching the jigsaw take shape. Little Man loved the finished floor puzzle. He loved he could sit on it. He loved all the bright colours and patterns. He kept looking over at his sisters and smiling. I don't think he could quite believe what they had done. He was so happy. 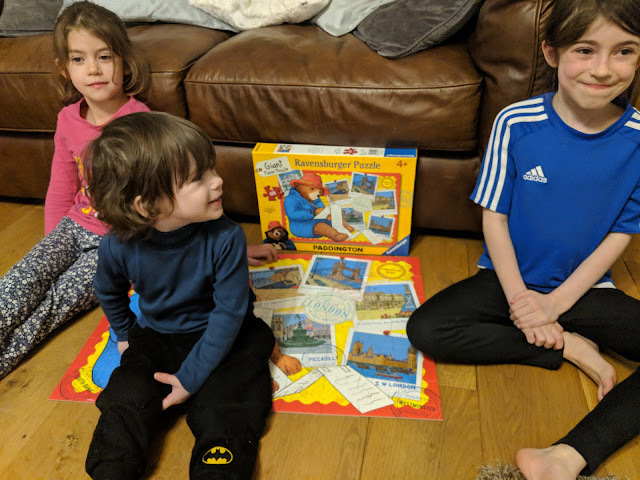 It was lovely watching the three of them play together especially given their age ranges I was surprised that something could keep all three of them entertained together. Our question for the evening was would there be a third snow day? The Paddington puzzle was sent for review, all words are my own opinion.